Looking for an Alaska salmon fishing adventure like non other? The famous waters that flow past the Alaska Sportsman’s Lodges are the perfect place to cast your line. We offer 5-star luxury lodging on the banks of the Kvichak river. These pristine fishing destinations are famous for breathtaking scenery and trophy-sized King salmon. Our guides are world-class professional anglers and take pride in their ability to teach their clients everything that they will ever need to know about Alaska salmon fishing and the surrounding wilderness. Our lodge offers an Alaskan wilderness experience that can be enjoyed in rustic luxury and relaxation. 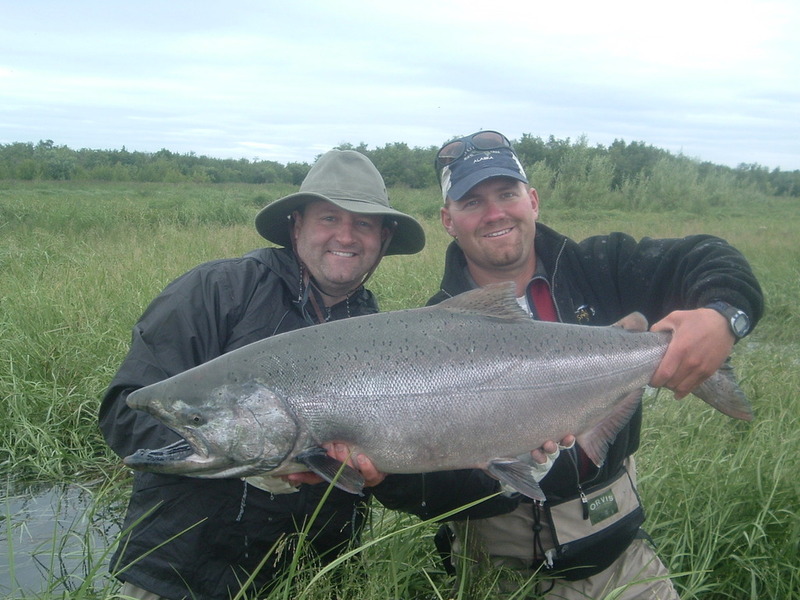 The Alaska Sportsman’s Lodges is proud to invite guests to enjoy an exhilarating getaway on the banks of the majestic Kvichak River which flows through the heart of the famous Bristol Bay region. Just 4 miles from Lake Iliamna, this wilderness castle boasts of snow-fed streams that are busting at the seams with all types of Alaskan King Salmon, Rainbow Trout, and other trophy fish. The crystal clear waters of this region offer impeccably pure and pristine conditions that allow these fish to grow to the enormous sizes that make this region prime for Alaska salmon fishing. As these waters flow across the rugged tundra on their journey down from the icy mountain peaks, they converge to form rushing crystal clear habitats for salmon runs that rank in the millions and Rainbow Trout that average up to 30 inches. When you choose to stay at one of our lodge, you are choosing to nestle down into the lap of luxury in the heart of the Alaskan frontier. We are proud of our high-quality and high-class 5 star services and we guarantee your satisfaction with all of our all-inclusive packages. Our lodges fill up quickly so call today and let us help you plan an amazing Alaska fishing adventure!